For many people, the garage is more than simply a place to park the car. It is a storage space, a workshop and one of the areas that give your home life. However, unless you put some effort into making your garage neat, organized and attractive, it is easy for this space to become cluttered and messy. It makes sense because we spend so much time in this area and often use it as an entryway, so everything that comes into our home goes through the garage. Why not begin the process of renovating this ever-important space? Does the project seem like it would be too complicated? While you can certainly choose a complete renovation that changes it from floor to ceiling, there are several tasks that you can do yourself to improve this space. 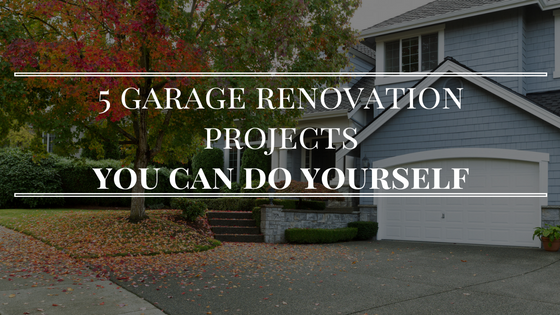 We’ve put together five jobs that you could start working on this weekend and make a huge change in how your garage looks and feels. Has your garage become a collection space for clutter? Having too much clutter in the garage is very common because we all wind up storing items in this area because we are not sure where else to put them. While you may be storing certain things that need to stay, like tools and athletic gear, most of us make the mistake of keeping unused items. Take a couple of hours to go through your garage and rid yourself of anything that you haven’t used in at least six months (unless those items are seasonal, such as Christmas decorations, of course.) Then, consider having a garage sale to make a few extra dollars to put towards your renovations or donate your unused items to a local charity. In fact, in some areas, some groups will send a truck out to pick up your donations to save you time and effort. Just clearing out these extra items can make a huge difference. 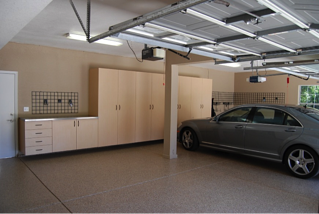 If you are looking to make additional space in your garage, one of the best places to look is up. For many homeowners, thewalls and ceiling are often unused or underused. You can use the wasted space on your garage ceiling to store many items you don’t use on a regular basis. Consider adding bike racks or hooks, for instance, to hang your bicycles away during the cold months. You may also be able to store skis or other seasonal gear using designated racks or hooks. Check out the options, and take advantage of this space. You will be amazed by how much area this can open up throughout the rest of your garage. Instead of stacking bins and boxes precariously, why not utilize a shelving system? Install shelves along the walls of your garage and you will be able to get those bins off the floor. Not only will this make your garage look neater than it did, but it keeps your items safe from water and pests too. While simple shelving may be all you need, take a look at the options. If you desire something more complex, shelving could be something that you want to hire a professional to tackle. Have you put much planning into the layout of your garage? Creating zones for this space can be one of the best ways to keep everything organized and easy to find. Take a pad of paper and pen and sketch out the ideal layout for your space before you begin putting anything away or doing any renovation. For instance, you may have a “tool area,” a “sports area” a “seasonal area” and so on. If you have a workspace, make sure it is safely separated from general storage, so you have plenty of room to work without worry of bumping into things or knocking anything over and spilling it. While it may seem over-the-top to lay out the plans for your garage, the results are well worth it when you have a convenient workspace and plenty of storage—without all of the mess. Yes, garage cabinets are one of the best ways to keep your gear out of the way, your garage organized and everything looking its best. However, this is one thing you should leave to the professionals. Far too often, people install cabinets, and they fall apart after just a few weeks. Investing in high-quality cabinets will give you storage and workspace that you can count on for years to come. However, you can begin by determining the space that you want to devote to cabinets. Clear out any other items and get a rough measurement of the area. Also, decide whether you have any specific needs (as far as countertops, racks, shelf space, etc.) Then, when you contact the professionals, you will be able to express exactly what you want in your cabinets. This will make it easier to get a quote on the job. 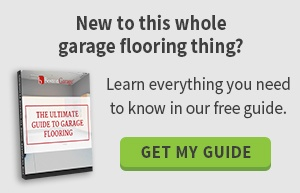 Take a look at your garage and imagine the possibilities. While there are many things that you can do to improve your garage yourself, when it comes time for a big change, make sure you get in touch with the best firm to complete the job for you. Boston Garage is the leader in luxury garage enhancements. With over a decade of experience, we can work with you to turn your garage from a simple place you keep your gear into the work and storage space you’ve always dreamt it could be. Reach out to us today to learn more. We look forward to working with you and helping you turn your dreams of a beautiful, well-organized garage into a reality.